Before leaving the wide expanses of the interior plateau, and entering one of the few passes through the formidable Coast Mountains, travelers on Highway 20 to Bella Coola will want to stop and enjoy Bull Canyon. Situated just below the confluence of the Chilko and Chilcotin Rivers, the blue-green waters rush past the campground. Although the river is frigid with glacier melt, the air is dry and fragrant with interior grasses and pine trees. The 343-hectar park lies on the north side of the river, and is centered on scenic Bull Canyon. There is an interpretive trail in the park that offers access to small caves in Bull Canyon Mountain. 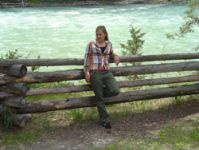 Activities include walking beside the Chilcotin River, wildlife viewing and nature appreciation. The park’s towering basalt cliffs, which are very good for bat sightings, once provided a natural enclosure for local ranch bulls. Although fishing in portions of the river within the park is possible, there are many lakes nearby. The park is often used as a base from which to explore the Chilco region, and is a good place to stop before reaching the vast wilderness of Tweedsmuir Provincial Park. There are 20 vehicle accessible sites in this quiet, forested park. There is also a day use area, pit toilets, picnic tables, fire pits, firewood, and water pump. During the off-season from the end of September to mid-May, the gates at Bull Canyon are locked. Bull Canyon is the only provincial campsite along Highway 20 between Williams Lake and Tweedsmuir Provincial Park. Bull Canyon Provincial Park is located 118 km west of Williams Lake and 6 km west of the town of Alexis Creek on Highway 20.